Teen Cancer America (TCA) has partnered with the Robert H. Lurie Comprehensive Cancer Center of Northwestern University to help expand the Adolescent & Young Adult (AYA) Oncology Program. The program, led by clinical psychologist Stacy Sanford, PhD, and oncologist, Jennifer Reichek, MD, provides specialized services and resources for young people (ages 15-39) at Northwestern Memorial Hospital and Ann & Robert H. Lurie Children’s Hospital of Chicago. The Who’s Roger Daltrey and Pete Townshend are the founders and driving force behind Teem Cancer America. Having spent more than a decade working with Teenage Cancer Trust in the UK, Daltrey and Townshend decided to bring their passion across the pond in 2012, and make a difference in the lives of teens and young adults with cancer in the United States. 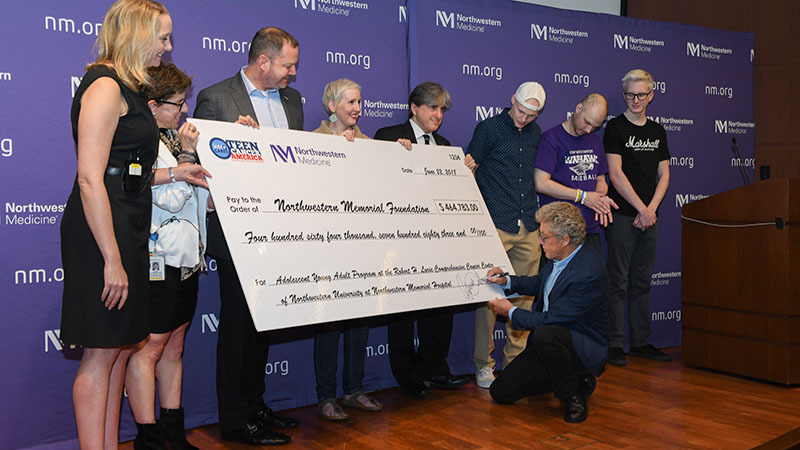 Teen Cancer America, Inc., is giving a gift of nearly $500,000 to Northwestern Memorial Foundation in support of the Adolescent & Young Adult Oncology Program at the Lurie Cancer Center. Often, young patients are caught between the worlds of pediatric and adult oncology, not quite fitting into either. This program expansion will help provide a unique home for AYAs treated in both the adult and pediatric clinical affiliates at Northwestern’s Lurie Cancer Center.